teenagedreamer100: A tiny bit of shopping! So this is over the last couple of weeks so don't worry! I have bought a few different things varying from make-up to body and skincare. I really like this gel as it smell delicious I just want to eat it! It has aloe vera gel in it which makes your skin really soft and moisturised. At the moment it is £2 instead of £4 which are both really good deals. I would invest in it again but I wont for a while as I have found a little goes a long way! Models own nail polishes are pretty amazing! The colour variation is really good. Although being quite expensive at £5 they are amazing! Boots are currently doing buy one get the cheapest half price on all of their products. This is an absolute bargain so get them at this price while you can. I bought two polishes which can be worn alone or as a topcoat. The two nail polishes are Jack Frost and Freak Out. 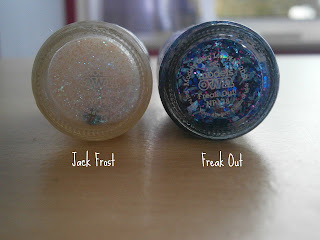 Jack Frost is part of the wonderland and Freak Out is part of the Mirrorball set. They both dry really quick which is great if you are in a rush. I would describe Jack Frost as snow because that's what it looks like- it is a clear nail polish with pink,orange, purple and blue tiny pieces of glitter. Freak out is a really good party nail polish- again it is a clear nail polish with big and small different shapes and colours including purple and blue. Mac Paint Pot in Painterly- I use this as a eye primer so that my eye shadow sticks to it and lasts longer, this also makes the colour more pigmented. I chose Painterly as my skin has a more pinky tone to it rather than yellow. For £14.50 you get 5g and a selection of 9 colours. Miss Sporty Fabulous Lash Mascara- I have this in 001 Black. It makes your eyelashes thicker, fuller and longer. This mascara is great as you get 8ml instead of 7ml which makes it last longer. It is really cheap at £1.99 and it also lasts longer which is a double bonus! MUA Mascara- I have this one in clear. I am a bit disappointed with it as it is a very wet formula and doesn't do a lot. I have to say though it does define your eyelashes. It is great for £1 though especially if your just starting with make-up. Both of these lipsticks are £1 and are available at Superdrug or on their site. These lipsticks are amazingly pigmented and last for a while. Although you do have to have moisturised lips so the lipstick glides on well and lasts. 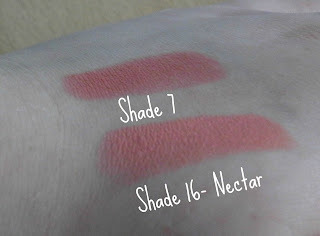 Shade 7 is a berry pink which I think would suit any skintone. Shade 16- Nectar is a more orangey coral colour which also would suit most skintones. I think for £1 you get a lot of product which is amazing! Collection formally known as Collection 2000 concealer is amazing! It covers absolutely everything dark circles, blemishes and red areas. It is great over foundation or just on its own. At the price of £4.19 it is really good coverage and lasts ages. You can buy this in 4 different shades which i think they should expand on.